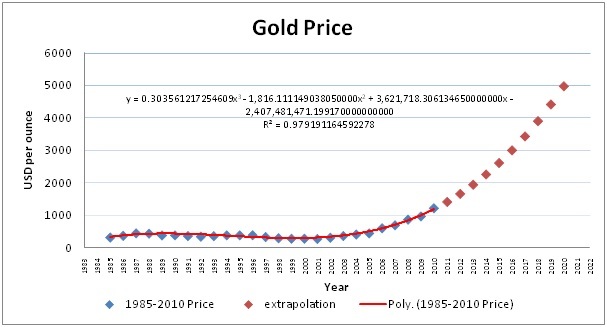 From the previous blog (w9), we have noticed that the price of gold is significantly increase than three decades ago. How about the oil price? What is prediction of future oil price in year 2020? Is the curves of gold and oil are paralel?Does the shockingly increased oil price recently has correlation with the gold price? To figure out forecast to the future, we can applied the forecast model curve of gold price on the current oil price. Other alternative is generate the curve by using the previous data of oil from 1985 and forecast it to 2011. We also can see whether the both curves are parallel or not. The regression is fitted by Polynomial order 3 with R value 0.904. 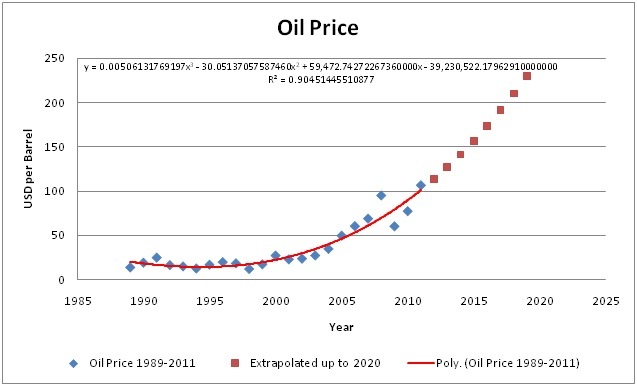 Using the equation of polynomial order 3 we can extrapolate the data to forecast the oil price to year 2020. Now it’s clear that on 2020, the oil price based on gold increment (1) has a different value than the oil price extrapolated data (2). From this result, we can say that the both curves is not quite parallel, even they are both have increased prediction. 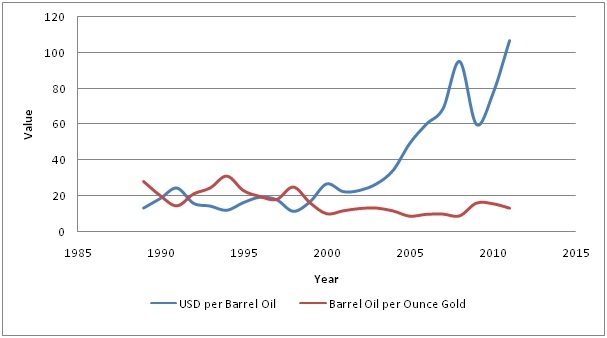 The gold price has steeper curve than the oil price. That’s why if we saving our money in the form of gold, would become a reasonable decision these days. From the above graph we can say that even the oil price is increasing, the ratio of Barrel Oil per Ounce Gold is relatively stable, means that if the oil price increase, the gold price also increase. It’s because the increase of oil price is driving inflation high. The price of gold reflects the expectation of the level of inflation. Gold sought at times erratic. Hence if there is an increase rate of inflation, the demand for gold increases that caused the high price of gold in the market. The above thing should get attention from government of Indonesia, the country that has a world largest gold mine, to strengthen the national gold reserves. And manage the national mineral resources for the benefit and welfare of People of Indonesia, than to enrich some foreign companies. The forecast model is based on assumption of do-nothing scenario, means there is no intervention by government on gold price, and its driven by market value and inflation only. Otherwise it will be need more adjustment to obtain a valid model and value. G., Wicks, Elin M. & Koelling, C. Patrick (1942), Engineering Economy15th Edition, Singapore: Prentice Hall, Inc. This entry was posted in Adi Nugroho, Week #10. Bookmark the permalink. Absolutely AWESOME, Adi!!! Very well done!! You even took this beyond Candra this week!! Nice work!!! Now my question to you, is say you had a 4 year project and were trying to conduct a feasibility analysis. The first thing you would do is project the INFLATION costs of the project forward based on the price of gold (How many ounces or lbs is your project worth) Then you would calculate the PW (NPV) of those cash outlays back to today’s dollars, using either MARR or WACC. THEN you would have a much more reliable project feasibility analysis, based on the commodity price, rather than based on the projected increases in labor, materials and equipment, which is valid data, but much wider upper and lower control limits. I hope you and Candra will take some time to meet up with David and Bu Lilly as both of them seem to be struggling with this and the two of you seem to really have this mastered. Thanks and keep up the good work!!!! hum!!! wondering if the article owner went “BUY” on all of the instruments mentioned on this page ! oh one more question ! is he/she still alive ?